The Winnipeg Free Press is pairing with Penguin Books to publish a commemorative book that will mark Winnipeg's historic re-entry into the National Hockey League. Back in the Bigs: How Winnipeg Won, Lost and Regained Its Place in the NHL , will be written by award-winning sports writer Randy Turner, and is due out in September. "We want to tell the story by bringing the past to life... not just archives, but dozens of interviews with major players, on and off the ice," Turner said. "There is a direct link to the Jets' early years, which explains why NHL hockey left, but the passion never did -- even for all those 20-somethings celebrating in the streets who barely saw the team play." 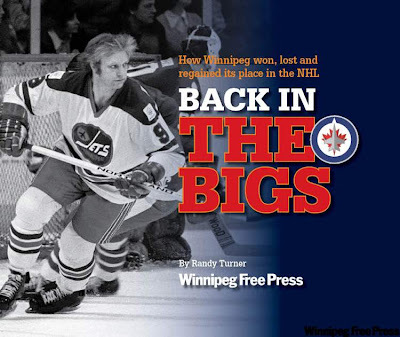 The book will track the history of pro hockey in Winnipeg, from the wild days of the World Hockey Association to the Winnipeg Jets's entry into the NHL in 1979; and from the heartbreaking loss of the franchise in 1996 to its triumphant return in 2011. I had my first chance to view the book while in Toronto at The World's Biggest Bookstore. The presentation quality is high, with some great photos from throughout the years gone by. I could only sample the text, but it seemed deep and interesting. Because of the beautiful lay out I am sure this book will be a winner with all Jets fans, not only in Winnipeg but throughout Canada and beyond. I will offer a full review when I receive my copy. In the meantime, The Winnipeg Free Press is offering a free excerpt about John Ferguson's impact on hockey in Winnipeg. Also, check out this video presentation on the book.